Proper care and maintenance of handmade Oriental or Persian rugs will not only extend their lifespan, but will also help them hold their value and beauty. We propose that you follow only two simple rules, and leave the more complicated tasks to a professional. Inspect your rug from time to time for signs of unusual wear, solid and liquid stains, and insect damage. Such problems tend to get bigger rapidly, so get to them fast. For more information, read the topics below. Avoid prolonged exposure to wet conditions as it can seriously damage your rug. One example would be watering a plant that is sitting directly on the surface of your rug with little or no protection. Perhaps the most dominating factor of premature wear in a handmade rug is accumulation of dust. When particles of dust get deep into the body of a rug, they act as sharp razors, and can easily cut the fibers in the pile when stepped on. So use a vacuum cleaner as often as you wish -at least once a week- and only be careful not to get the fringe caught in the suction. Every six months, also vacuum the rug from backside. This is probably a good time to rotate your rug as well. Rotation causes your rug to wear evenly as it will not be exposed to traffic in one single area. Water leaks from plants, and liquid spills, are the most common causes of stains on rugs. The key for a successful stain removal is to get to it fast. Use a clean white towel and blot the area. Colored towels should be avoided as they may increase the problem. If the moist has reached the back, use an iron (not on extremely hot setting) to dry it up. The affected area can be cleaned by regular dish soap in a small amount of cold water, using a soft sponge. Add a spoon of vinegar to prevent colors from running, and avoid excessive use of water. Use a dry white towel to absorb the water. Remember, you may need to have the rug professionally washed afterwards. If the stain is caused by animal urine, clean it up as soon as possible, as such stains can damage the fiber of the pile and cause a breakdown of foundation's material. Use an absorbent white towel to soak up liquids from both sides of the rug. Spray water to dilute urine and blot with a dry towel. We do not recommend the use of chemical sprays. Repeat these steps, let dry, and make sure no visible spots or strong odor remains. If this is the case, have your rug washed professionally. If a rug does not desperately need a wash, then it is better not to wash it. As is the case with any other fabric, unnecessary wash shortens the lifespan of a rug. To test if your rug needs a wash, rub the pile back and forth with strong motions of your hand for about ten seconds. If your hand gets dirty, then the rug needs a professional wash. Do not attempt to wash a handmade rug at home. Machines and chemical solutions for carpet cleaning are not suitable for your oriental rug. A professional wash starts with the process of getting the dust out of the rug, and is done by special devices. In order to prevent "color run", a mild natural solution is then spread out on the pile, and the rug is washed with regular detergents. It will then be rinsed with a large quantity of water, and another solution containing Chloride is added to the pile as a disinfectant and rinsed out again. The rug will be laid flat, preferably exposed to sunlight and fresh air, to dry up. Artificial heating devices are avoided, unless weather conditions leave us no other choice, as these devices give the rug a yellowish look. As the last step, it will be stretched to make it lay flat on the floor, just like a shirt that needs to be ironed after a wash. The rate for washing an Oriental or Persian rug depends on the quality, and is around $2.85 per square foot. Any repair on handmade rugs must be done by hand. The fringe of a rug is usually the first to receive damage, and can mostly be avoided by not getting it caught in a vacuum cleaner. If conditions permit, we will try to keep the original fringe, even if we have to make it shorter. If not, we will match the original fringe as for the texture, color, and thickness, very closely. Holes and tears are another type of damage to hand-knotted rugs. Get to them fast, as they will only get bigger in no time. For such problems, we will also match texture, color, and the quality of the wool with the original fiber used in the pile and the foundation. Rugs can also get moth damage, in which, bare spots in the pile or the backside of the rug can be seen. This type of damage usually leaves the foundation intact. We can do all sorts of repair and restore rugs damaged by moths. There are, of course, other ways an oriental rug can get damaged. 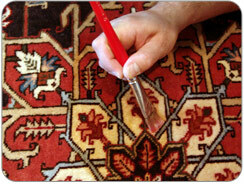 Do not be concerned: your rug is handmade, and repairs can duplicate the original work. Rug pads are inexpensive, add softness, and extend the durability of your rug. They make your rug safer to walk on by keeping it in place, and add comfort when you walk or sit on your rug. They prevent movement and wrinkles in a rug, and as a result, unnecessary wear. The pad you use should be slightly smaller than your rug. However, a smaller pad can be cut into smaller sections and laid under your rug at some intervals. Certain qualities of pads can be machine-washed. Small pieces of pads can be taped together to form a larger piece but avoid taping the pad to the rug. The adhesives can harm your rug. We offer different types and qualities of padding. Have your rug rolled up rather than folded. You should know that a dark environment, poor ventilation of air, and humidity are the most common causes of trouble when storing Persian and Oriental rugs for a long period of time. Such conditions attract insects like moth and carpet beetles, which feed from fibers of the pile, but usually not from the foundation. To be more precise, moths do not eat your rug, but the eggs laid by a female moth hatch into larvae, and it is the larvae that consume wool. You need to prevent these insects from establishing in the storage area. We recommend that you unroll your rug every two to three months, vacuum clean it, and let it get some fresh air, or ideally, some sunlight. To prevent storing damages, it would be a great idea to have your Oriental or Persian rug professionally washed before storing it. For additional precautions, have your rug moth-proofed.